Low expansion foam will seal and stop the passage of air, water, dust, fibers, insects, and sound into a building. 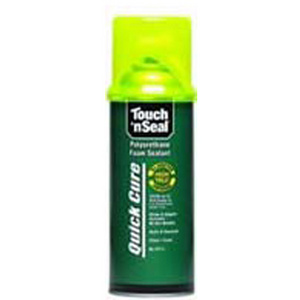 Ideal for sealing areas too large to be sealed with a bead of caulk, such as holes through which pipes and wires pass. Ideal for small jobs, foam is dispensed directly from the can, and contains no CFCs or urea formaldehyde. Can may be held in any direction, used in hard to reach places. Seal cracks, fill holes and insulate joints quickly and easily. VOC content only 130 g/l, satisfies the emission factor limit required by the US Green Building Council LEED for Homes Green Building Rating System (requiring less than 250 VOC g/l). • Density – 1.75+/-.25 lbs./cu.ft.